Logically, all of us know that urban legends are exactly that: legends. But stumble across an obscure, grainy video at 2:00 AM when the house is dark, and logic ceases to be much comfort. Try as our brains might to suggest otherwise, our bones just seem to know that the Slender Man is out there somewhere, waiting for us. And he can wait forever. By the cold light of day, none of the following stories of madness and suicide seem all that convincing. But read them again under the cover of darkness and you may just find yourself sleeping with the lights on. A few years back, an internet rumor surfaced about the suicide of a young Japanese girl. Shortly before killing herself, the teen had drawn a self-portrait, which she then posted online. Curious to see this slice of suicide memorabilia, a number of Korean forums picked up the image and began re-posting it. That’s where things got weird. Users had a hard time looking away from this melancholy picture. Some began re-posting it time and time again, saying that its eyes were drawing them in. Others noticed that if you stared at the picture for any length of time, it began to alter subtly—the faintest trace of a smile surfacing around the dead girl’s mouth. Yet others reported feelings of intense sadness after seeing it. It’s said that one or two even killed themselves. It’s now thought that anyone who spends too long looking at the image runs the risk of falling into this same deadly obsession. At least it would be, if the original artist hadn’t found out about this rumor and posted a fed-up message on his website, debunking the whole thing. Still, you’ll forgive us if we decline to spend too long looking into those creepy eyes. Picture this scene: The year is 1983. A group of religious scientists have come up with an interesting new theory that any human brain untroubled by stimuli would be able to sense the presence of God. Finding a willing volunteer—an old man with a terminal illness—they painstakingly seal off his nerve endings. Then they sit back and wait. What happened next is like H.P Lovecraft’s worst nightmare. For a couple of days, the old man whispered about his deteriorating state of mind. On the fourth day, he claimed to hear distant voices. On the sixth, his dead wife began speaking to him. Then things really went downhill. Luckily, the tale is nothing more than a particularly spine-chilling example of an urban legend. But it’s creepy enough to have utterly freaked some people out, and now seems to periodically resurface whenever the Internet is in need of some gut-wrenching terror. 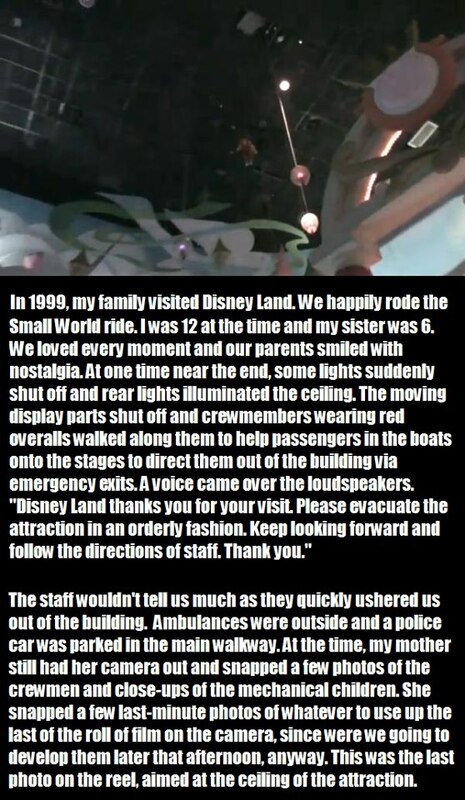 There’s something about Disneyland that attracts tales of suicide. Go to almost any corner of the Internet, and there will be someone claiming they saw a body hidden away on one of the rides. But perhaps none of these tales compare to the Small World suicide. The story goes that the Small World ride unexpectedly closed one day in 1999. Midway through the ride, the music cut off, the lights went up, and employees asked the tourists to leave. When asked what was wrong, they gave vague answers and ushered everyone outside. Supposedly, one of those tourists just happened to be holding her camera. As she left, she snapped a picture or two and forgot all about it. At least until the film came back with this photo. Yeah, that’s a child there, hanging from the rafters. The story goes that the kid hanged himself while the happy families enjoyed the ride, blissfully unaware of the nightmare dangling above them. In case that sounds too far-fetched for your taste, we should point out that there very nearly was a successful suicide at Disneyland Paris last year. So it’s not as unlikely as you might think. Have you ever found yourself wondering exactly what goes into those prepackaged, mulch-meat sausages you sometimes buy? Well, if you lived in Tucson, Arizona, in the ‘60s, you’re about to find out . . . The story goes that the owner of a meat-packing plant woke up one day to find his kids missing. With the help of his brother, the two scoured the farm but could find no trace of the missing kids. After a few hours they called in the police, who made a horrifying discovery. The stuff coming out the meat grinder that day was human flesh—pulped and ground down to goo. Realizing this could only be his missing kids, the owner retreated to the plant’s boiler room and quietly hanged himself. Pretty grim, huh? Well it’s only just beginning. Twenty years after the kids were murdered, workers at the plant stumbled across a terrifying scene. The brother of the former owner had been strung up in the boiler room, the words “I DID IT” carved across his chest. At the same time, visitors to the town cemetery reported that the soil above the owner’s grave had been disturbed sometime in the night. Fast forward to the present, and it’s said that you can see the ghosts of the two children falling into the grinder every October, while on Halloween the two hanged men make their way back to the boiler room. It’s a video of a man looking into a camera without expression for roughly two minutes. It’s been up on YouTube without comment and seen by hundreds of people. And it’s meant to drive you utterly, stark raving mad. Known as the Mereana Mordegard Glesgorv video, the legend goes that it was pulled by YouTube in the early days after they realized its effects. According to the story, those who watched through to the end would see the expressionless man smile an evil smile. After that they’d lose it. People were said to have clawed their own eyes out after seeing the whole video. Others were said to have taken knives and hacked their own arms up. Yet others were supposed to have killed themselves. It’s said that nobody can get even 45 seconds in without screaming, and to go any further is to sacrifice the last shreds of your sanity. At least, that’s the story. In reality, the video is of a guy called Bryan Cortez and you can see him today looking suitably non-demonic and friendly. But we won’t blame you if you give that video a miss. Just in case. The creepy “lost episode” is a whole sub-genre of modern urban legend. But none has ever been quite so twisted as the legend that started them all: the story of the lost Mickey Mouse cartoon. According to the legend, this cartoon is “nothing special.” It features a black-and-white Mickey walking past a repeating background, white noise playing on the soundtrack. At two minutes in it cuts to black and that’s it. Or so it seems. Wait until the sixth minute, and the cartoon is meant to reappear. Only now the white noise has been replaced by the distant murmur of voices. The background Mickey was walking against has begun to distort in ways painful for the human eye to see, and Mickey himself is smirking unpleasantly. From then on, the cartoon supposedly becomes a nightmare. A scream starts to rise up on the soundtrack as Mickey himself seems to decay, his eyeballs falling out and his grin getting ever wider. Impossible colors begin flickering across the screen, burning rubble rises in the background, and then . . .
Well, it’s said that nobody knows what happens next. The only Disney employee to ever watch to the end committed suicide shortly after. All he left was a note describing the final frame: a piece of Russian text that translates as “the sights of hell bring its viewers back in.” And now it’s somewhere out there on the Internet, waiting for you to find it. Back in 2010, a rumor surfaced about a creepy Soviet sleep experiment. In the 1940s, Russian researchers had exposed five political prisoners to an experimental stimulant designed to keep them awake. Then they sat back to see what happened. As they soon found out, nightmares happened. Although the men were fine at first, they slowly began to descend into paranoia. As the days passed, an epidemic of screaming began to grip them one by one, until one screamed so loudly he physically tore his vocal cords. Then they all fell silent. After three days of nervous waiting, the scientists supposedly went to check up on the prisoners. Opening the door, they found Hell. Four of the patients had butchered and eaten the fifth, then turned on themselves. In a fit of madness, the men had torn chunks of their own skin out, bitten off fingers, and even tried to disembowel themselves. And yet they continued to smile, as if in a place of utter tranquility. From here on in, the legend gets way too gory to describe here. Suffice to say, Snopes has thoroughly debunked the whole thing. But if you find you mind turning back to those emaciated Russian madmen (WARNING) tonight, let’s just say you won’t be alone. Unlike most items on this list, the story of Tengoku ni Musubu Koi—the Japanese suicide film—doesn’t have a specific source it can easily be traced back to. Instead it seems to have built up over the years, to the extent that it’s hard to tell where reality ends and fiction begins. The story goes that, in 1932, two Japanese student lovers committed suicide by leaping into a volcano. When the public became enthralled by their story, famed director Heinosuke Gosho hurried to do a movie version. Known as A Love That Reached Heaven, his movie was a monster smash hit, becoming popular with couples across the country. All this is true. Now here comes the creepy bit. According to various histories, couples watching the film would become so enamored by it that they began killing themselves in the auditorium. Not just one or two, but hundreds. Most versions of the story have it that ushers were forced to patrol the aisles in case anyone committed suicide during the screening; yet many, many hundreds still managed to die. There seems to be no reliable record of this tumultuous time. The closest is a reference in a book on Gosho, which states that a few lovers were inspired to jump into the volcano by his film—hardly the nationwide theater bloodbath of legend, but still, you wouldn’t catch us watching it. Somewhere on the Internet, there’s a photograph you really don’t want to look at. A scanned-in Polaroid image of a “smiling” husky dog in a dimly lit room, it’s meant to be just about the creepiest picture you will ever see. So creepy, in fact, that it will drive you mad. The legend goes that it was first posted to Usenet sometime in the 1990s. Known as Smile.jpg, it’s said to induce seizures and feelings of panic in those who see it. But that’s not the worst part. The worst part is the smile itself. Almost freakishly human, the dog’s twisted smile is meant to haunt your dreams, driving you slowly mad. Most versions of the legend report that this nightmare dog orders those who’ve seen it to “spread the word,” passing on the demonic file to another unlucky soul. Most kill themselves at this point. Others simply pass the message along. Although originally written as a story a few years back, the Smiling Dog somehow caught the Internet’s imagination. It’s cropped up on countless websites, and still does the rounds as a supposed urban legend. Looking at that cheesy-yet-eerily-convincing Photoshop smile, it’s easy to see why. A couple years ago, someone reported a particularly freaky encounter on Reddit’s LetsNotMeet board. Since then, similar encounters with “The Smiling Man” have been reported across the country, but we’ll give you the terrifying original. The story goes that the poster was out late one night on a deserted Seattle street when he encountered a man “dancing” on the sidewalk. Thinking he was drunk, the guy stopped to let him pass, at which point he got a good look at his face. According to the legend, the “dancing” man wasn’t drunk. Nor was he well. His eyes were wide open, wild, and unfocused, staring at the night sky. His face was split by a wide cartoon grin that looked almost painful. He looked utterly mad. At this point, the narrator crossed the street, and then things got freaky. The Smiling Man began to watch him, following his movements while still grinning at the sky. When the poster turned his back, the man would vanish, suddenly reappearing on the other side of the street. When the poster watched him he’d just freeze, his insane smile unwavering. At this point the poster decided not to take his eyes off him. Bad move: The Smiling Man came toward him, taking exaggerated, tiptoe steps, just like a cartoon. A cartoon that can move very, very fast. After a while he began to chase the poster, running after him at frightening speeds, that insane, wild grin still plastered on his empty face. Eventually, the poster made it to a well-lit street and the story ends. But there is a twist. See, the LetsNotMeet forum isn’t a place for generating urban legends. It’s about telling your real-life encounters with real-life people. That’s right: Unlike everything else on this list, The Smiling Man is as real as you or us. And he’s out there somewhere, just waiting to meet you in a darkened alley.